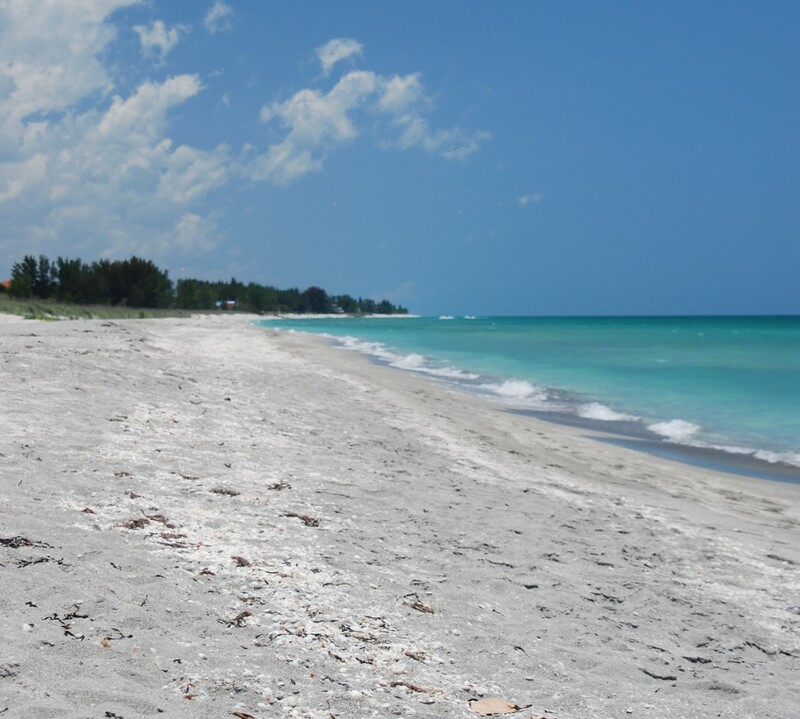 I just returned from my beach vacation to Anna Maria Island. My peaceful place is in a chair with my toes in the sand. I could stay there all day, but since I currently live inland, I can’t spend even half of my time with toes in the sand. So, I keep a table top beach that I can stare at during the day, play with and dream over, kind of like a zen garden. The purpose of a zen garden is to have a place of peacefulness. A traditional outdoor zen garden is a space of sand and rock. A large outdoor zen garden could include open space, compact plants, wildlife homes like butterfly or bird houses, benches, sculpture, curving paths, trees or no trees. It’s really what you want that would bring peace to your soul. A desk-top zen garden can do the same. You choose a traditional theme or one that would give you peace in your work space or home, simply by viewing and meditating on it. 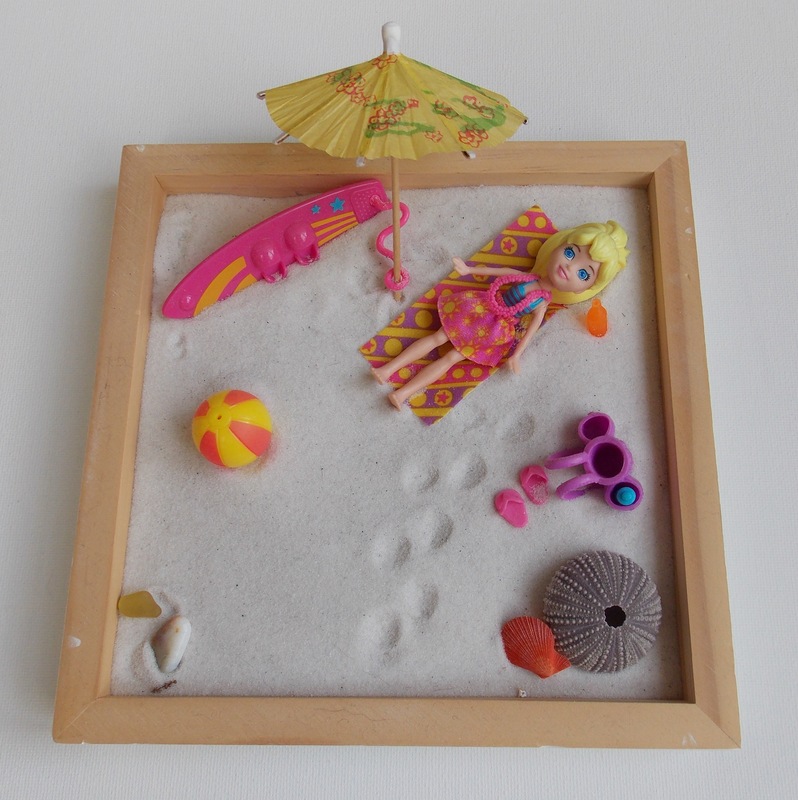 For me, picking a beach theme for my zen garden was a no-brainer. Pondering the design of my garden, I decided a doll sitting in the sand on a chair with a beach tote, shovel and some shells would be great. The shovel would represent the “rake” and the shells would represent the “6 polished rocks” typical of a zen garden. I chose a chipboard box from a craft store and filled it with sand from one of my favorite beaches. There is a little piece of sea weed included. My character is a blonde-haired Polly Pocket doll (couldn’t find a brunette with the right accessories) with a beach towel, backpack, drink bottle, sandals, surfboard and beach ball. It was the best I could find; no chair to sit in so she rests on a beach blanket. I added a cocktail drink umbrella for sun protection. Typical zen gardens contain a rake which is said to foster creativity and relieve stress. I didn’t want a rake in my zen garden. Beaches are windswept and meant to be stepped on. When I see them raked and manicured near resorts, I cringe because I don’t find it to be natural and peaceful. I like the footprints, the sweeping dunes, the cusps and scarps, the ridges and runnels. Don’t rake my beach; play in it. Traditional zen gardens also include six polished stones in specific shapes for specific reasons. My garden is specifically a calming, contemplative garden and I chose to use one unpolished but beach-worn sea urchin test, a sea shell, sea glass and beach rock. My zen garden is colorful and bright. It is both peaceful and stimulating and provides, for me, the serenity that I need when I find myself staring at it and falling into a joyful state thinking of memories of my beach days and anticipating future ones. My zen garden is perfect for me right now. It sits on a table next to my desk and in front of the window that I look out of to watch the birds. Place in a calm spot in your home or office and enjoy. **disclaimer: I am not paid to endorse any of the clothing or supplies in this story. I am only sharing my thoughts on what I think are great beach combing duds. Beachcombers come in all sizes, shapes, philosophies, and goals. Finding the great items along the shore are, to some, an art; to others it is luck. Some people specialize in sea glass, while others only want shells or drift wood or pottery shards. We all have the same goal of finding something, but what we do with it can vary. A man in Pensacola, Florida catalogs and stores everything he finds in boxes in his garage. A lady in Sarasota picks up broken shells of all sizes and makes wonderful pieces of art with them. A family in California sells their findings on the internet for people to use for their crafts. I display some of what I find in my house and use the rest for crafts and jewelry. Beachcombers, however, all have one thing in common: two hands. And when those two hands are full of great finds from the shoreline, it is a bit difficult to move on and continue combing the surroundings. As tacky as it may seem to some, many beachcombers carry a plastic grocery bag to the beach with them. These bags are rather large so they can hold a great amount of beach shells, glass and other findings. They’re also waterproof. We each have our way of doing things and our favorite containers to carry. Here are some ideas. 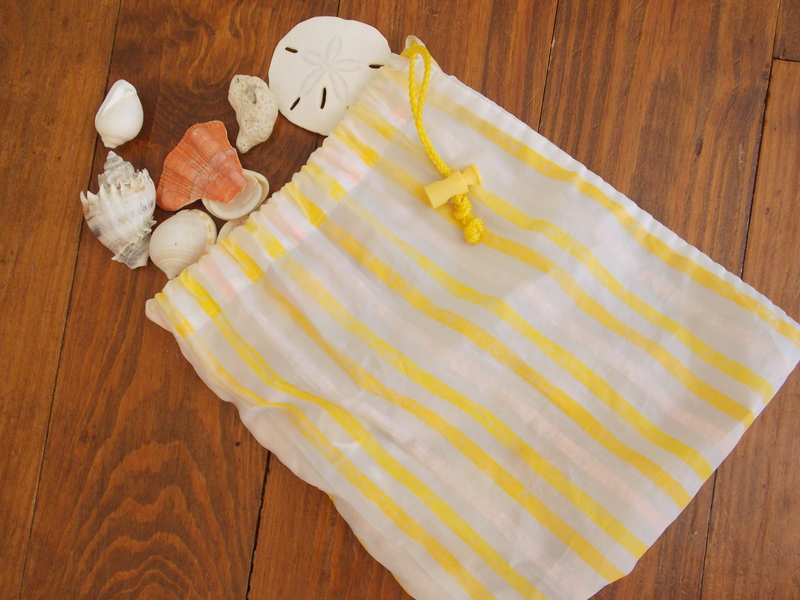 My favorite thing to carry and load up with beach finds is an 8”x10” drawstring bag made of quick-drying fabric. Instructions follow to make your own or you can order one from my Etsy store: Crafty Beachcomber. They’re on back order right now so please email me through my store for a custom order. I have asked a few of my friends who are “professional beachcombers”, like me, what they carry when scavenging the beaches. Jody Diehl, who owns Beach Treasures and Treasure Beaches.com, has to travel a distance to the beach so she keeps things simple and lightweight. Jody says she mostly uses “her pockets but usually uses great big to-go cups or large baggies.” Check out her website to read her beachcombing adventures or find her on Facebook at One Shell at a Find. If you aren’t a “bag person” and like to make quick trips to the beach for salt-air therapy, shorts or a skort with cargo pockets are great. Regular pockets tend to be shallow and the more items you put into them, the greater chance you’ll lose something when you bend over to pick up the next cool find, or when you sit down on your beach chair or car seat. Cargo pockets are big, have 3 sides and a flap that snaps the pocket shut, holding your beachcombing booty inside. 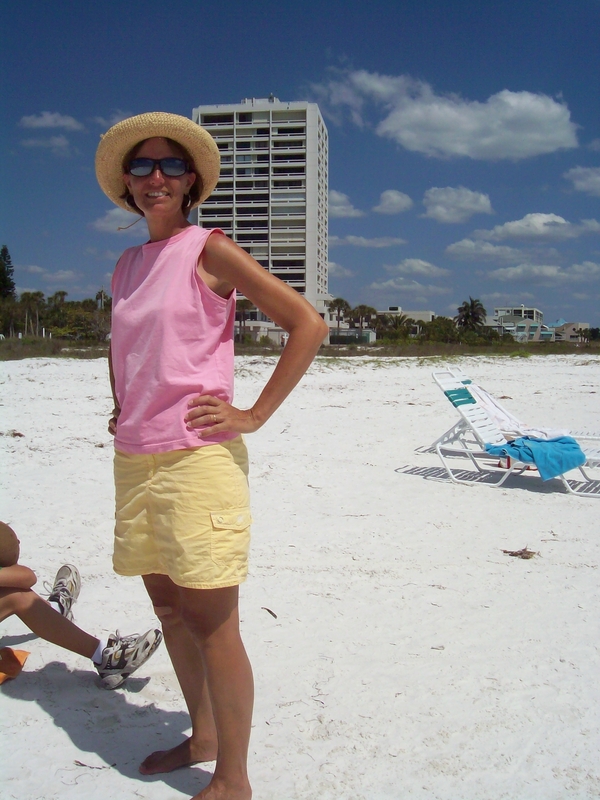 My favorite clothes for beachcombing are cargo pocket skorts like the Rip Stop Skort from LL Bean. Lightweight, it is comfortable to wear on a hot day. There are other cargo pocket skorts around to try. Be sure to find one with large side pockets. My favorite has always been the cargo skort from Fresh Produce. They’ve changed their design this year with a smaller side pocket but if you have access to one of their outlet stores you may still find this great item with the larger pockets on the sale rack. 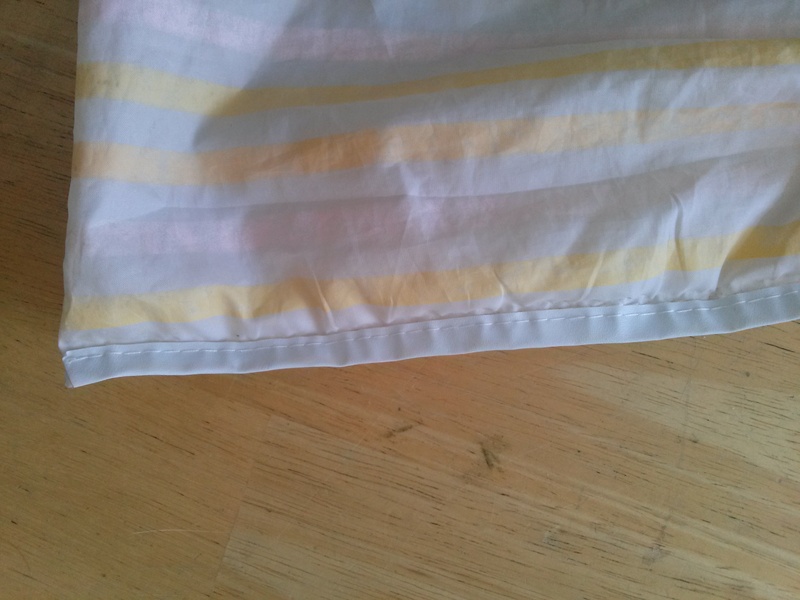 The fabric dries quickly, too. But, any cargo skort will do. My favorite beachcombing outfit. Note the large cargo pocket. If shorts are your thing, I want to recommend Calvin Klein Jeans Utility Shorts. The style for shorts this summer (2014) is too short to include cargo pockets but the folks at Calvin Klein Jeans solved that by making perfect length cargo shorts that also roll up shorter and are secured with a button tab. They are really comfortable and look great on. The cargo pocket is deep. These come in a dark blue, orange and white. There are plenty of other great beachcombing cargo-pocket bottoms but these are my favorites. A long walk on the beach may force you to use both clothes with a deep pockets AND the drawstring bag or container of your choice. Nothing wrong with that; you’ll be able to collect more, and look fashionable doing so. Fold over the top edges and run a stitch one inch from the top leaving the “rope holes” open on the one side. Feed a cord/rope through one hole and out the other. 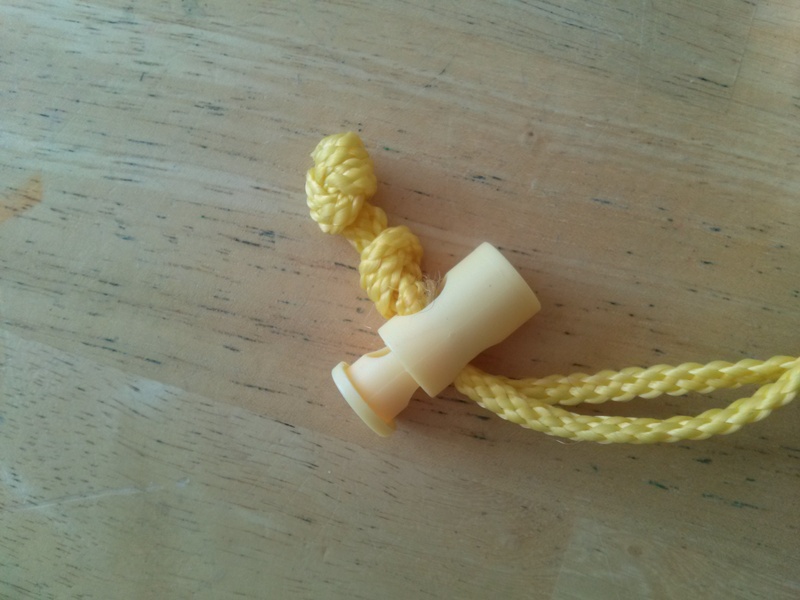 Clamp the ends together with a plastic spring-stop toggle-cord lock and tie a knot at the end of the ropes. Turn the fabric outside-out and enjoy. Graduations are almost over and folks are heading on vacation. 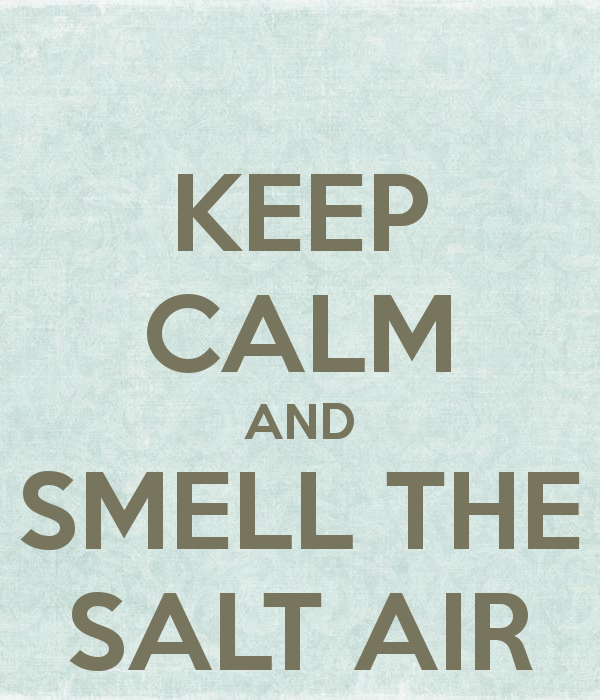 Others are taking weekend trips for a breath of salt air. If you are lucky enough to live coastal, no matter where in the U.S., any warm day in the sand will do, right? So what do you take with you? What’s in your beach bag? A popular magazine has a regular feature asking just this question. Problem is, they ask celebrities and their answers, in my humble opinion, just don’t fit the question. First, a swimsuit is featured. If I have a beach bag ready to go, my swimsuit and little tunic or sarong is already on me and the bag is filled with things I need. Second, things like perfume, or even Eau de Toilette Spray, would not be in my bag. That’s for after my shower, when I get home from the day on the beach. If I would take “after shower” items, I may as well carry shampoo and conditioner, too, but I wouldn’t. A hat would be on my head, if I choose to wear one. Sunglasses would be on my face. Earrings will be in my ears. Sandals will be on my feet, and they won’t be $375 variety, either. Sand is rough on shoes and sandals, not that I’d wear them on the beach, but if you don’t get all the sand off of your feet, you can cause some damage to your sandals with a little friction from the sand. 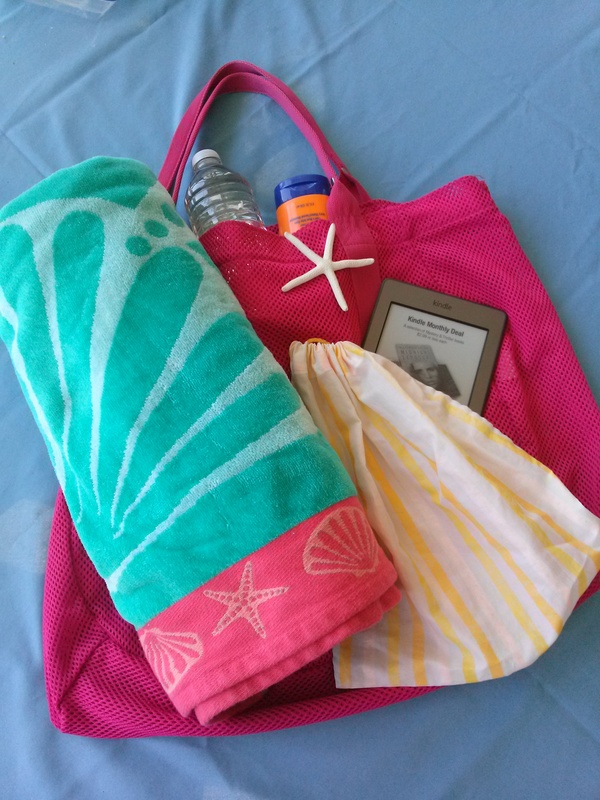 So what’s in my beach bag? My beach bag includes sunscreen, water bottle, small bag for beach combing collectibles, my Kindle in a ziplock bag to keep sand off of it, a waterproof bag for my phone, drivers license, credit card, and car key (I try not to carry a purse or heavy wallet), sometimes a small sketch book and drawing pencil, and my Nikon (in case I want better photos of shorebirds than my phone can deliver).